Trump Invites Congressional Leaders For Meeting, Says "Let's Make A Deal"
... has invited a bipartisan group of congressional leaders to the White House on Wednesday, now that the House is officially in democrat hands, in a bid to negotiate an end to a partial government shutdown that is now in its second week and rapidly approaching the longest shutdown ever of 21 days, and suggested he wants to “make a deal." In the first sign of a possible opening for negotiations, the invitation went to the top eight Republican and Democratic leaders in both the House and Senate, and the meeting is expected to include a briefing on border security from the Department of Homeland Security, a congressional aide told the WSJ. However, with Democrats - now with a House majority - feeling emboldened in their negotiations with the president, it was unclear if Democrats planned to attend the meeting. 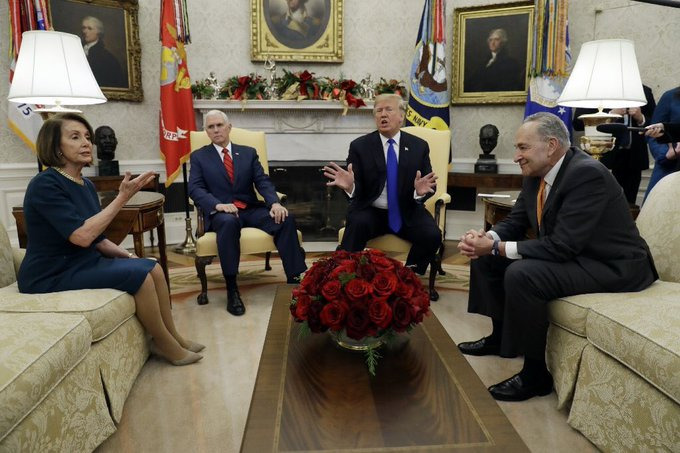 Since the shutdown began in late December, Trump and congressional Democrats have largely avoided direct negotiations; the two sides remain at odds over spending for a Southern border wall, with Trump insisting on funding for the wall and Democrats staunchly opposed. Meanwhile, Trump has remained steadfast in his demand to obtain funds for the wall, and on New Year's Eve tweeted that "throughout the ages some things NEVER get better and NEVER change. You have Walls and you have Wheels. It was ALWAYS that way and it will ALWAYS be that way! Please explain to the Democrats that there can NEVER be a replacement for a good old fashioned WALL!" Meanwhile, Congress returns to work later this week when it opens a new session Thursday, with Nancy Pelosi taking over the speakership after Democrats won control of the House in the midterm elections. 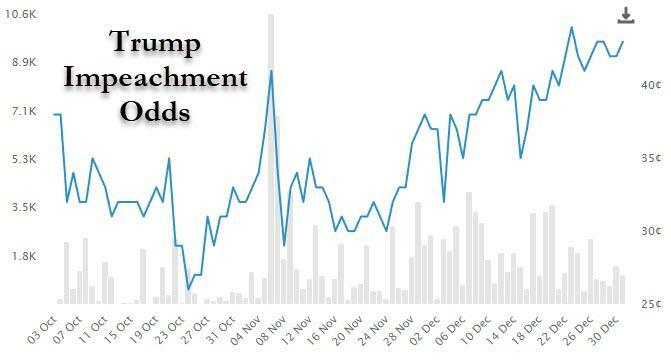 In light of that, and the upcoming conclusion of Robert Mueller’s investigation which is expected to wrap up in February, Trump's impeachment odds on PredictIt recently hit 50% for the first time.